What’s your go to kick when you’re diving? Why? Whenever I ask this question, most people don’t really have an answer as to why they use the kick that they do. Just as important, many times the kicking technique is less than efficient. 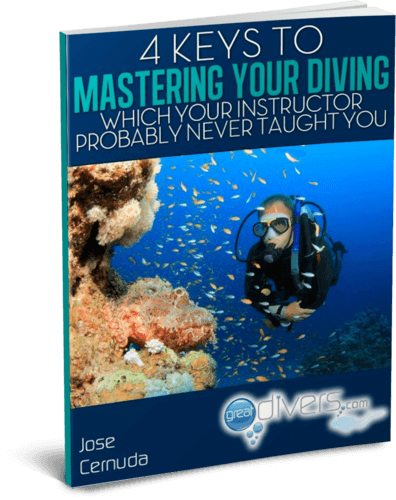 In this article, I want to show you the two most common kicks in scuba diving, when to use each one and demonstrate how to perform each kick efficiently. The two main kicks used when scuba diving are the flutter kick and the frog kick. The flutter kick is the scissor-like kick which is similar to the kick you would do if you were swimming freestyle. This is the kick most people instinctively do when they first start scuba diving and snorkeling. The frog kick is the kick which resembles the kick used when completing the breast stroke. It’s named the frog kick because it resembles a frog kicking underwater. These two kicks are go-to kicks used when scuba diving. What many people do not realize is that they have two distinct purposes and should be used accordingly. In the video below I describe the two kicks and when to use each one. 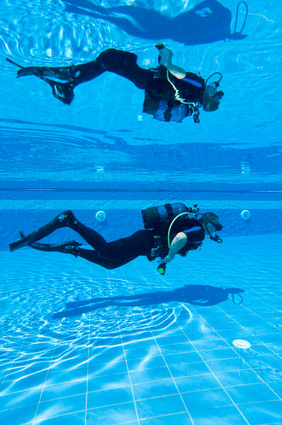 Before going into the kicks themselves, it’s important that you understand some general principles that will make any kick you use underwater more efficient. First, you want to make sure you make yourself neutral in the water. The kick should only be used to move your body horizontally in the water column. If you are kicking to stay off the bottom, then you are wasting energy. IN order to be efficient, you must be neutrally buoyant. Second, you need to get used being in a horizontal position. This position will eliminate drag in the water and help you move to where you want to go without wasting energy. Finally, you need to know which kick to use and when. The flutter kick is a power kick. It is the kick you should use when you need to either move rapidly or move powerfully because of a strong current. Because it is a power kick, it is also the kick which consumes the most amount of gas. This is because the flutter kick has no resting phase. When you are flutter kicking, you are basically constantly moving. The key to an efficient flutter kick is to keep your feet relatively straight, your toes pointed, your ankles loose and let the power come from your hips. You can see in the video below how I demonstrate this kick. The frog kick is the more efficient of the two kicks presented here. It’s the kick you should be doing most of the time. The frog kick has a built in resting phase. That is to say, once you kick you get to rest and recover while you are gliding forward. Because of this, you’ll consume less gas while diving using a frog kick. The video below describes and shows how to do an efficient frog kick. The key to both of these kicks is knowing when to use each one, and to practice them both until you have mastered them. One huge help in getting your kicks right is to use an underwater camera to see how you look while you are diving. Many people are surprised to see both what their kicking technique looks like, and what their body position is like. Cameras like the GoPro make it relatively inexpensive to see what you look like in the water. I’m curious to know, what kick are you using most of the time and why? Let me know in the comments below.